BUSHWICK — Two Brooklyn-born actors with Italian roots and a passion for pizza are bringing traditional Sicilian slices and street food to the neighborhood. 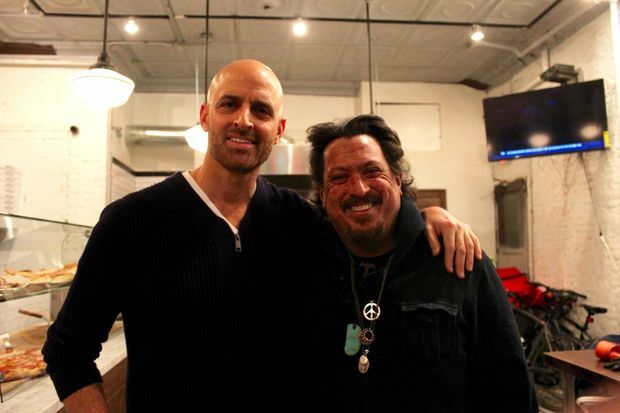 Santo Fazio, 53, a pizza maker with three decades experience linked to starting up East Village shops like Two Boots and co-owning Three of Cups, has teamed up with his buddy Anthony Nocerino, 51, an actor and public school teacher, to open Fazio's Sicilian Pizzeria and Rosticceria. The shop, which opened in late November at 709 Knickerbocker Ave., specializes in thick-crusted Sicilian slices topped with toppings like soppressata, a dry-aged salami, and other Sicilian street foods like scaccia, rolled pizza, calzones and Arancini, rice balls. The duo, both from Red Hook, met in acting class in the early '80s and were roommates for seven years in Hell's Kitchen and have been good friends ever since. While the two have earned their bread money working various jobs over the decades, both have continued acting over the years, with Nocerino playing parts in Spike Lee's "Jungle Fever" and "Malcom X" and Fazio acting in several "Law and Order" episodes and "The Accidental Husband." For Fazio, both pizza and acting are passion projects. "There is an art to pizza making that I think gets lost," he said. That starts with the dough, he said. In order to perfect the Sicilian slice you need to capture, "all the textures, the chewiness under the sauce, the fry cooked at the bottom, a moist crunch but not a dry cracker crunch." Nocerino, an English teacher at Brooklyn Collegiate in Brownsville and Bushwick resident for the last decade, has nostalgic memories of eating pizza with friends as a kid after he'd collected pocket money from his paper route. He still sees the joy pizza brings to his students these days. "I say, 'I'm ordering pizza' they just go nuts, 'Oh my God, pizza yes."" Sicilian slices cost $3, specialty slices go at $3.50 and Sicilian Pies cost $18.50. Visit Fazio's website for the full menu and hours of operation.